Register for your vendor booth here! In the event of a duplicate booth type/brand, we will take the first registered and paid. After you have submitted your form and are approved, we will email you an invoice. If you require electricity, please send us a picture of the plug so we can accommodate. Setup can begin at 6:00 am and vehicles not involved directly with your booth operation must be moved by 7:00 am. You are free to leave at 3 pm but we invite you to watch the awards presentation. If you are a food vendor, don’t forget to contact the Stone County Health Dept. 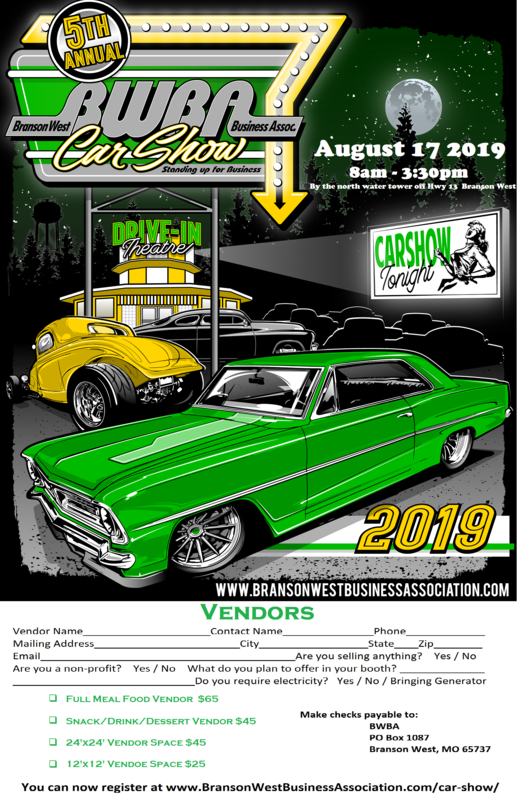 If you would rather pay by check, please click the picture below to print the Vendor Registration form to mail payment instead.